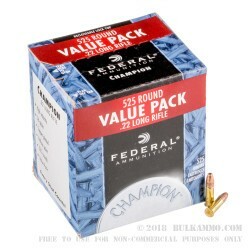 This .22 Long Rifle ammunition from Federal's Champion series is an accurate, cost-effective target load well suited to high volume target shooting and hunting. 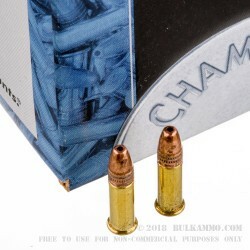 Each cartridge in this box of 525 fires a light 36 grain copper plated hollow point bullet at a high muzzle velocity of 1,260 feet per second. This helps it deliver deadly expansion against squirrels, rabbits, and other small game. Federal rimfire ammunition is loaded at the company's 175 acre headquarters and main production plant in Anoka, Minnesota using rimfire-primed brass cases. 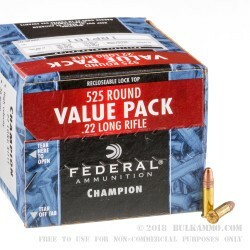 Fast service, good price, great ammo! I've been searching for bulk ammo since the temp's got above freezing around here and didn't have a lot of luck. I managed to find a couple of boxes of this ammo at a local gun store and snatched them up. I've only put 30 rounds through my Walther built Colt .22LR M4 style rifle. No failure to feeds; no failure to fire. all 30 rounds were in the black (and I'm not a strong shooter). The rifle tends to be pretty tempermental on feeding so it was important for me to find a round that worked reliably. If there were problems they would have shown up within the first 30 rounds. Good Stuff, I have ordered 5,000 rounds of this ammo and it works great. Very little problems with it. Will buy more. Excellent fodder for any .22 rimfire weapon. Fast Service! Great Product! Fair Prices!! 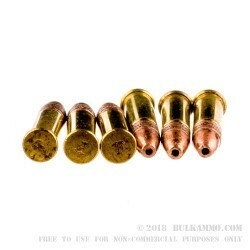 Q: Why do most copper jacked .22 LR rounds come in Hollow Point? Even the high speed rounds seem to come almost exclusively in hollow points, would this reduce their speed and performance? A: Hollow point 22LR ammunition is popular as being reasonably accurate for bulk ammo purposes. This does not have a negative effect on their speed or performance. If anything, it will help them perform better.